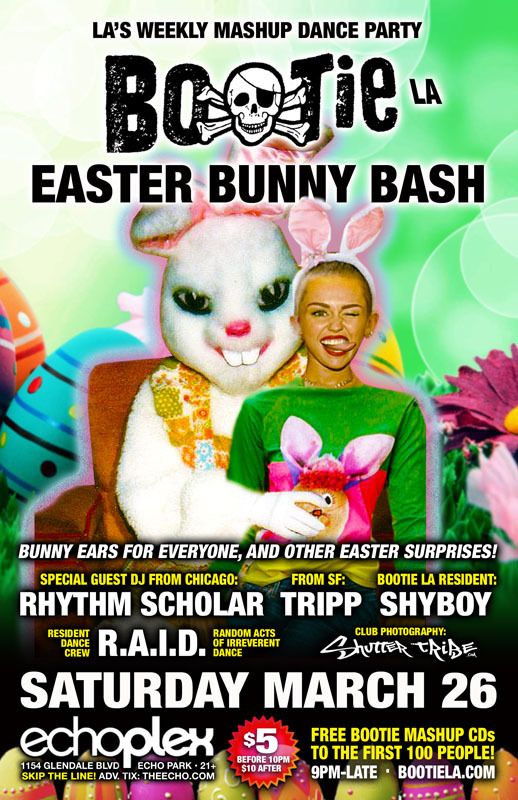 Bootie LA: Easter Bunny Bash! Los Angeles Bootie LA: Easter Bunny Bash! It’s Easter weekend, do you know where your bunny ears are? If you don’t have your own, grab some here because Bootie will have bunny ears for you — plus other Easter surprises! For this special party, direct from Chicago, Bootie LA is proud to present special guest DJ Rhythm Scholar, whose unique mashup and remix sets are infused with his signature brand of funk and disco, sure to keep you on the dance floor! Plus Bootie SF’s Tripp and Bootie LA resident DJ ShyBoy join him in keeping the Easter beats flowing as they all mix in springtime mashups throughout the night! Of course R.A.I.D. will be throwing down the go-go moves that keep you hopping, and Shutter Tribe will be on hand to snap shots of all your Easter bonnets!